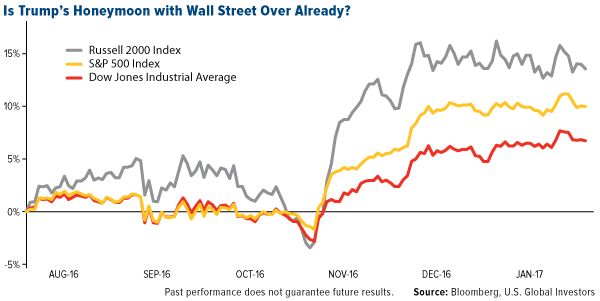 After little more than two weeks, President Donald Trump’s honeymoon with Wall Street appears to have been put on hold—for the moment, at least—with major indices making only tepid moves since his January 20 inauguration. That includes the small-cap Russell 2000 Index, which surged in the days following Election Day on hopes that Trump’s pledge to roll back regulations and lower corporate taxes would benefit domestic small businesses the most. And therein lies part of the problem. Although the President managed to sign an executive order last week requiring the elimination of two federal regulations for every new rule that’s adopted (and ordered a review of Dodd-Frank and former President Obama’s fiduciary rule), other campaign promises that initially excited investors—tax reform and an infrastructure spending deal among them—might have already hit a roadblock. According to Reuters, a three-day meeting in Philadelphia between President Trump and congressional Republicans ended in a stalemate, with it looking less and less likely that tax reform will happen during Trump’s first 100 days in office—perhaps even the first 200 days. As for infrastructure, several Republicans were reportedly wary of committing to such an enormous spending package before more complete details become available. Meanwhile, Trump’s seven-nation travel ban received a lukewarm—and, in some cases, hostile—reception from many in the business world who have traditionally depended on foreign talent. That’s especially the case in Silicon Valley, where close to 40 percent of all workers are foreign-born, according to the 2016 Silicon Valley Index. (Around the same percentage of Fortune 500 companies were founded by immigrants or children of immigrants, including Steve Jobs, whose biological father was Syrian.) 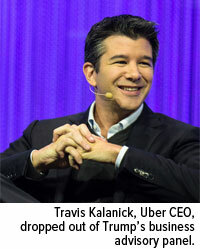 One of the more dramatic responses toward the travel ban was Uber CEO Travis Kalanick’s dropping out of Trump’s business advisory panel, following an outcry from users of the popular ride-sharing app who saw his participation with the President as an endorsement of his immigration policies. I’ve shared with you before that the media often take Trump literally but not seriously, whereas his supporters take him seriously but not literally. I think it’s evident that the market is finally coming to terms with the fact that Trump, unlike every other politician before him, actually meant everything he said on the campaign trail, including his more protectionist and nationalist ideas. Although I don’t necessarily agree with Trump’s plans to raise tariffs, withdraw from free-trade agreements and restrict international travel, it might be easy to some to see why he feels American companies need protecting from foreign competition. Last week I attended the Harvard Business School CEO Presidents’ Seminar in Boston, and among the topics we discussed was China’s ascent as an economic and corporate juggernaut. Take a look at the chart below, using data from Fortune Magazine’s annual list of the world’s 500 largest companies by revenue. 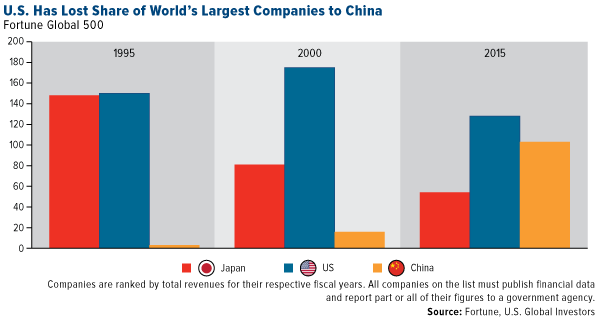 Whereas the U.S. has lost ground globally over the past 20 years, China’s share of large companies has exploded, from having only three on the list in 1995 to 103 in 2015. The number of Japanese firms, meanwhile, has more than halved in that time. I will say, while I’m on this topic, that the uncertainty and unpredictablilty surrounding Trump has given active management a strong opportunity to demonstrate its value in the investment world. Assessing the risks and implications of his actions, policies and tweets, which change daily, really requires a human touch that fund managers and analysts can provide. One of those implications is the U.S. dollar’s decline. Following Trump’s comment that it was “too strong” and hurt American exporters’ competitiveness, currency traders shorted the greenback, causing it to have the worst start to a year since 1987. 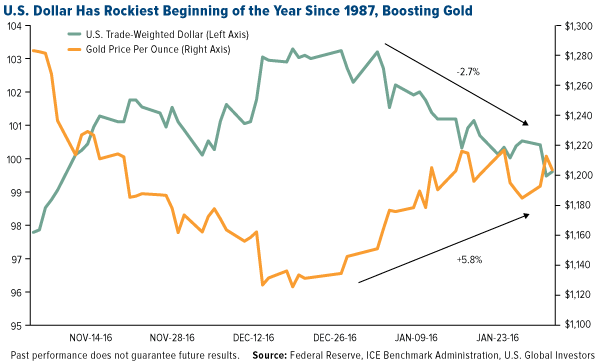 This, coupled with a more dovish Federal Reserve, expectations of higher inflation and growing demand for a safe haven, has helped push gold prices back above $1,200 an ounce. January, in fact, was the best month for the yellow metal since June, when Brexit anxiety and negative government bond yields sent it to as high as $1,370. Demand for gold as an investment was up a whopping 70 percent year-over-year in 2016, according to the World Gold Council. 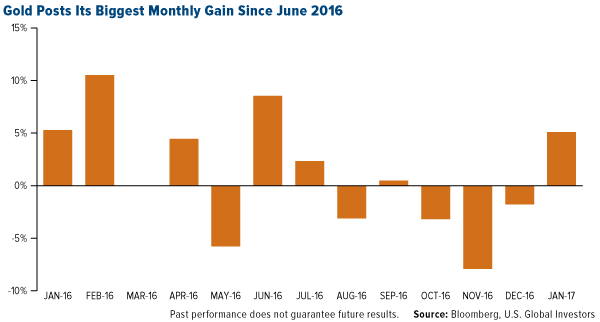 Gold ETFs had their second-best year on record. But immediately following the November election, outflows from gold ETFs and other products accelerated, eventually shedding some 193 metric tons. But now, just two weeks into Trump’s term as President, the gold bulls are banging the drum, with several large hedge fund managers taking a contrarian bet on the precious metal. Inflationary pressures are indeed intensifying. U.S. consumer prices rose 2.1 percent in December year-over-year, their fastest pace since 2014, and inflation across the globe is beating market forecasts, with the Citi Global Inflation Surprise Index turning positive for the first time since 2012. Anything above zero indicates that actual inflation is stronger than expectations for the month.